The Giants acquired Melky Cabrera from the Kansas City Royals in a trade for Jonathan Sanchez. I will forever love Sanchez, but he had become an unknown. The stuff that had helped the Giants win in 2010 had disappeared. So when the Giants traded him for outfield help before the 2012 season I was sad to see him go. Melky Cabrera came up with the Yankees. Early on he came through a few times and became a fan favorite, but it didn't take long for the Bronx to turn on him. There seemed to be potential, but it never came together. Melky was a 4th outfielder in Atlanta in 2010, he didn't do much and seemed on the verge of turning in to an end of the bench kind of guy. Kansas City signed him for 1.25 mil for the 2011 season, and Melky thrived playing with no pressure. As an every day player he put up career best numbers with 205 hits and a .305 batting average. This is a good time to point out that I am not sidestepping Melky and the PED's. That just comes at a later time. The biggest question was, could Melky be counted on as a starter on a playoff caliber team? 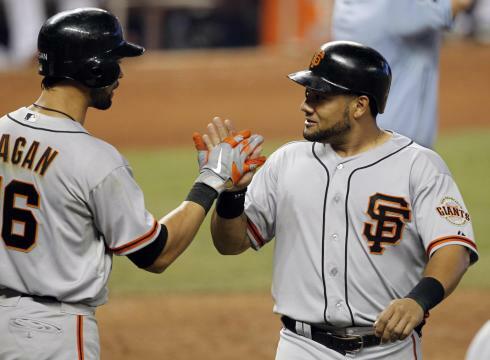 The way San Francisco fans reacted to him seemed to make Melky feel at home. By the time I started watching the Giants in June he had already reached folk hero status. Before the All Star break Cabrera was on a tear. He batted .353 and already had 7 triples. He was a slash hitter that was using all of AT&T to his advantage. The Giants had exactly what they wanted in the 3 spot, right ahead of Buster Posey. 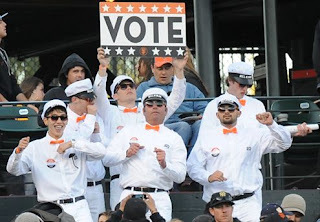 They were fun to watch and the Melkmen added to the carnival of winning Giants baseball. It was as I started getting in to the season that the big push for All Star ballots was going on. The fan base of the Giants are Internet savvy, so they rolled out a campaign to get some Giants to the Mid Summer Classic. Buster was a no brainer. He was coming off of a horrific broken leg and was playing like it never happened. Getting Melky to the game also wasn't hard. His numbers were speaking for themselves all over the league. The wild card was Pablo Sandoval. The Panda missed a month after having surgery on his left hand. He was productive when he was out there and the fans love him. So Pablo beat out David Wright for starting 3B of the National League. The All Star Game is one of my favorite things about the baseball season. I don't like the fact that it determines home field for the World Series, but that's the rules now. This season though, it felt like it may matter. I always root for the National League, but 2012 was special. Matt Cain started the game for the NL. The Giants had 3 starters out of 8 position players. If the Giants wanted home field, it was up to them to take it. It was that little extra spice that made the game more meaningful. By the time Cain took the mound in the bottom of the 1st, the game already seemed all but over. The NL had scored 5 runs off Justin Verlander, and the Giants players were right in the middle of it. Melky got it started with a base hit to left, and was driven in on a Ryan Braun double. Verlander then struck out Joey Votto looking. It looked like he would get out of it with only one run. Then he walked Carlos Beltran. Buster, in his first All Star plate appearance, also walked. The bases were loaded for the Panda. On a 1-1 pitch from the greatest pitcher in the American League, Pablo's hands flew through the zone and hit it deep down the right field line. There was that moment when it looked as if it might go out and Giants fans would lose it. The ball fell at the base of the wall and bounced, and Panda went in to third with a bases clearing triple. 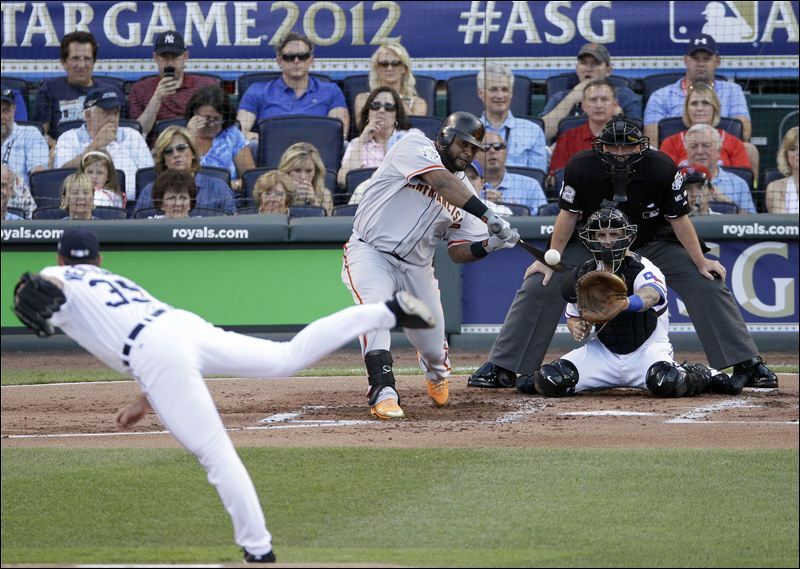 Sandoval's at bat against Verlander would foreshadow future meetings, but we didn't know that yet. All we knew was that the NL had a 5-0 lead and Matt Cain taking the hill. Starting the All Star game just a month after a perfect game seemed to put Cain in elite company. He went out and proved it on that July night in Kansas City. In 2 innings of work he faced 7 batters. The only hit being a Jeter infield hit to lead off the bottom if the 1st. In the 4th Melky struck with a 2 run HR that put it away for good as the NL cruised to a 8-0 win. 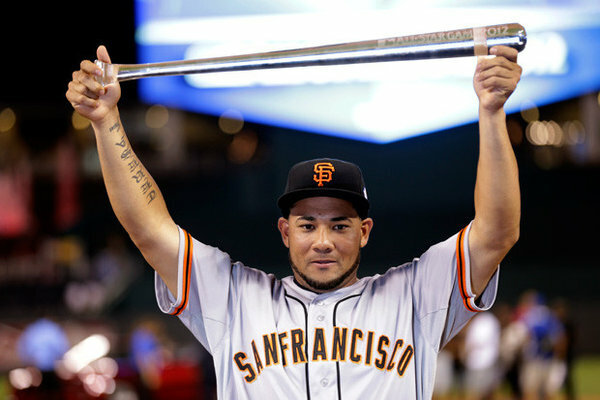 Matt Cain was the winning pitcher and Melky Cabrera the MVP. Pablo Sandoval had proven he belonged, and it wasn't even his best moment of the year. The Giants players had set the team up for home field if they somehow made it to the Fall Classic. The second half of the season was setting up to be quite memorable. Little did we know, the best was yet to come.